Deepika Kumari, who was leading the standings after the fifth end, finished 20th in the women’s individual ranking round in a big disappointment to India. Bombayla Devi and Laxmirani Majhi finished 24th and 43rd respectively as Indian women’s team took the seventh spot. 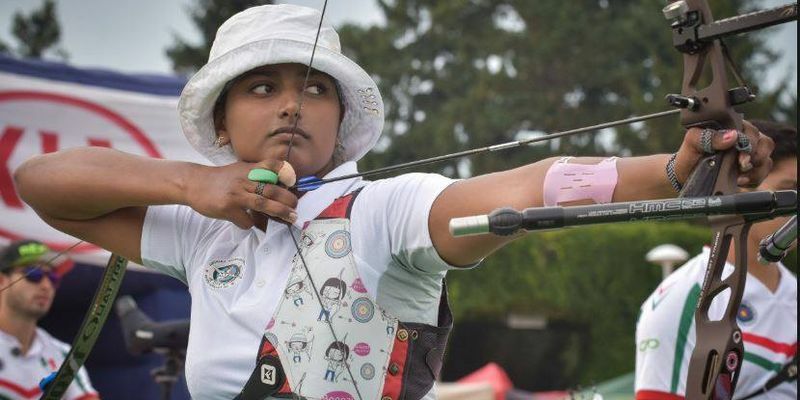 22-year-old Deepika Kumari, who equalled the world record in April at the Archery World Cup in Shanghai, looked on course for another milestone in the first five ends as she scored in the high 50s. She was ninth after the first end, but reached the top of the standings by the fifth end with scores of 56, 54, 54, 58, 58. But, before the half-way mark, she lost her composure and fell to fifth in the rankings after scoring a below-par 49 points. Her sudden dip in performance continued as she hit another poor score, which included a miss, in the next end to slid down to 18th. Although she improved her scores in the next two ends, another horror end, where she hit a five, pushed her down to 23rd. She finally settled for the 20th spot in the rankings with 640 points. Bombayla Devi, who is participating in her third Olympics, showed her experience, and even though she started badly on the day with a first end of 52 points, the 31-year-old pulled it back to reach 8th by the half-way mark. However, similar to Deepika Kumari, the second half proved to be a bad one for Bombayla Devi as her scores took a tumble. The 31-year-old finally finished 24th with 638 points. If experience helped Bombayla Devi, inexperience and nerves showed for Laxmirani Majhi. The 27-year-old, who is participating in her first Olympics, started strongly with a 54-point first end and was 19th in the rankings, but slid down the table quickly after she failed to hit the 10s consistently. Although she improved slightly after the half-way mark, the poor run in the first six ends proved costly for her as she finished 43rd with 614 points. Deepika Kumari will next face Georgia’s Kristine Esebua, who finished 45th, while Bombayla Devi and Laxmirani Majhi will face Lisa Unruh of Germany and Laurence Baldauff respectively in the round-of-64 on Monday (August 8). South Korea’s Choi Mi-sun finished as the leader of the standings with 669 points, while fellow Korean Chang Hye-jin took the second spot ahead of Korea’s Ki Bo Bae with 666 points. In the women’s team rankings, India, who are ranked No.3 in the world, started the day at the second position, but they failed to keep the position much longer as the archers faced sudden dip in form. India finished seventh with a total of 1892 points and will now face Columbia, who finished tenth, on Sunday for a place in the quarter-finals. 2012 Olympic champions South Korea finished on the top of the team standings with 1998 points, while Russia finished ahead of China and Chinese Taipei to take the second spot. Follow our live blog for the Olympic updates.